For the use of natural light in indoor illumination, see Daylighting. For a similar operation with transportation tunnels, see Daylighting (tunnels). Here Marin Creek has been daylighted. In urban design and urban planning, daylighting is the redirection of a stream into an above-ground channel. Typically, the rationale behind daylighting is to revert a stream of water to a more natural state, for the purposes of runoff reduction, habitat creation for species in need of it, or for aesthetic purposes. Daylighting is intended to revitalize the riparian environment for a stream which had been previously diverted into a culvert, pipe, or a drainage system. In the UK, the practice is also known as deculverting. The term also refers to the public process toward such projects. According to the Planning and Development Department of the City of Berkeley, "A general consensus has developed that protecting and restoring natural creeks' functions is achievable over time in an urban environment while recognizing the importance of property rights." Natural drainage systems help manage stormwater by infiltrating and slowing the flow of stormwater, filtering and bioremediating pollutants by soils and plants, reducing impervious surfaces, using porous paving, increasing vegetation, and improving related pedestrian amenities. Natural features — open, vegetated swales, stormwater cascades, and small wetland ponds — mimic the functions of nature lost to urbanization. At the heart are plants, trees, and the deep, healthy soils that support them. All three combine to form a "living infrastructure" that, unlike pipes and vaults, increase in functional value over time. Some efforts to blend urban development with natural systems use innovative drainage design and landscaping instead of traditional curbs and gutters, pipes and vaults. One such demonstration project in the Pipers Creek watershed reduced imperviousness by more than 18 percent. The project built bioswales, landscape elements intended to remove silt and pollution from surface runoff water and planted 100 evergreen trees and 1,100 shrubs. From 2001 to 2003, the project reduced the volume of stormwater leaving the street in a 2-year storm event by 98%. Such a reduction can reduce storm damage to water quality and habitats for species such as the iconic salmon. Unfortunately, the engineering alternatives have a relatively expensive initial price, since they are usually replacing existing structures, albeit life-limited ones. Further, conventional systems generally do not consider full cost accounting. The NDS alternatives can also provide returns on investment by improving urban environments. The Street Edge Alternatives Street breaks most of the conventions of 150 years of standard American street design. Narrow, curved streets, open drainage swales, and an abundance of diverse plants and trees welcome pedestrians as well as diverse species. Adjacent residents maintain city infrastructure in the form of street "gardens" in front of their homes, visually integrating the neighborhood along the street. The Natural Drainage System united the community visually, environmentally, and socially. The 110th Cascades SEA (2002–2003) are a creek-like cascade of stair-stepped natural, seasonal pools that intercept, infiltrate, slow and filter over 21 acres (85,000 m2) of stormwater draining through the project. The historic stream network in Vancouver, B.C. In the 1880s there were over 50 wild salmon streams in Vancouver alone. However, as Vancouver grew, these streams were lost to urbanization. They were covered by roads, homes, and businesses. They were also lost when they were buried beneath sewers or culverts. The City of Vancouver and its residents are now making an effort to uncover these lost streams and restore them back to their natural state. Hastings Creek Restored at Creekway Park. Vancouver, B.C. The Hastings Creek Stream Daylighting Project was originally proposed in 1994 as a way to manage storm water and for aesthetic purposes. The idea was to bring the stream back to its once natural formation which would improve the surrounding habitat for wildlife as well as the originally proposed purposes. This project's plan was finalized in 1997, and work began the same year. The stream had existed in Hastings Park until 1935 when the Park became focused on entertainment rather than its original purpose when it was given to the city in 1889, which was to be a retreat for those with a passion for the outdoors. As the Pacific Nation Exhibition (PNE) grounds continued to expand there was a continued loss of natural woodlands, greenery and waterways. It was not until the 1980s when the surrounding community began to look at continuing to uphold its original purpose. The daylighting project made major progress in 2013 in the area located in the Creekway Park, which was originally a parking lot. The daylighted stream will one day connect the Sanctuary in Hastings Park to the Burrard Inlet. The progress made in Creekway Park is a major step towards this goal. This daylighting project also improved pedestrian and bikeway transit. This stream is now able to obtain the stormwater from the surrounding area, which reduces the load that is felt by the municipality's storm sewers. It is the storms in early autumn which provide the water flow for the creek, meaning that there is variable flow throughout the year. During the late summer months the moist soil is relied upon to maintain the vegetation of the area. 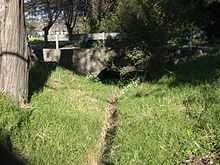 This variation in flow does not allow for salmon migration through the creek; however it does house trout as well as vegetation which aid in the filtration of the storm water entering the creek. Daylighted Stream at Spanish Banks, Vancouver, B.C. Located upstream from Spanish Banks waterfront, one of the highest profile creeks in Vancouver Metro became open to salmon in 2000. In a collaborative project between Spanish Banks Streamkeepers Association and the Department of Fisheries and Oceans Canada, barriers to fish passage were removed and habitat structure was added. Spanish Banks Creek was previously diverted through a culvert underneath a parking lot, but the lower reaches of this creek have been revitalized. The banks were stabilized with riprap, large woody debris was added for habitat cover, and spawning gravels were added in appropriate areas. Rigorous effectiveness monitoring has not been performed, but a few dozen coho and chum salmon are known to spawn there annually in a sustaining population. Maintenance to the creek is provided by Spanish Banks Streamkeepers Association, a local volunteer stewardship group. The East Vancouver neighborhood of Mount Pleasant has officially incorporated into its community plan a project to restore St. George Creek, a tributary to the False Creek watershed. St. George street is the site of this former stream, which now flows through the sewers and a culvert. This paved street will be converted into a shared-use path, riparian habitat, and urban greenspace. St. George Creek once spawned salmon and trout, and hosted a diverse riparian ecosystem. The restoration of this habitat using the rainway proposal would allow for salmon spawning, recreational and educational opportunities, and improve the community's access to nature and transportation alternatives. The proposal would pass the following community centres: Great Northern Way Campus, St. Francis Xavier School, Mt. Pleasant Elementary, Florence N. Elementary, Kivan Boys and Girls Club, Robson Park Family Centre. Detailed landscape designs have been produced, and incorporated into the community plan of Mount Pleasant neighborhood. Project leaders from the False Creek watershed Society and Vancouver Society of Storytelling have collaborated with Mount Pleasant Elementary students to create a street mural drawing attention to the belowground stream., To date, the mural is the only physical progress on the project. This is a future project aiming to ultimately connect the gap in the Seaside Greenway in order to link it to the Burrard Bridge. The beginning of this project has been started by the City of Vancouver in 2013, after its approval on July 29 of the same year. Volunteer Park is located in Kitsilano at the corner of Point Grey Road and Macdonald Street. This is where the main daylighting project for this area is planned to occur. Phase one is currently in progress. Point Grey Road is currently closed to through motor traffic in order to turn the street into a greenway for cycling and walking. This part of the project is expected to be complete by summer 2014. Phase two of this project is looking to include the daylighting of Tatlow Creek which is located in Volunteer Park. This phase must go through the City Council and the Park Board capital planning process for the 2015-2017 Capital Plan before any plans can be finalized. Tatlow Creek had been scheduled to be daylighted in 1996, and the project to start in 1997. The project was deemed feasible and the storm water was to be diverted back into the natural creek bed and tunneled under Point Grey Road. When it was not done, the project was proposed again by a UBC masters' student as the Tatlow Creek Revitalization Project. If this project is completed as phase 2 of the new Park Board Project it would allow for salmon and trout spawning. Since the 1990s there have been several plans to daylight the Jones Falls along much of its route through downtown Baltimore. Yonkers, New York, the fourth largest city in the state, broke ground on December 15, 2010 on a project to daylight of the Saw Mill River as it runs through its downtown, called Getty Square. The daylighting project is the cornerstone of a large redevelopment effort in the downtown. An additional 2 other sections of the Saw Mill River are planned to be daylighted as well. The first phase of the Yonkers daylighting was portrayed in the documentary Lost Rivers. The second phase, where the river runs under the Mill Street Courtyard, broke ground on March 19, 2014. Pipers Creek in the central to north Greenwood area is joined by Venema and Mohlendorph Creeks in Carkeek Park on Puget Sound. Pipers is one of the four largest streams in urban Seattle, together with Longfellow, Taylor, and Thornton creeks. Pipers Creek drains a 1,835-acre (7 km2) watershed into Puget Sound, from a residential upper plateau that is most of the watershed, through the steep ravines of the 216 acres (0.9 km2) of Carkeek Park. The headwaters begin in the north Greenwood neighborhood. Outside the park, the creek can be seen at N 90th Street between Greenwood and Palatine avenues N.
Years of hard work by neighbors and volunteers have brought salmon back to Pipers Creek, Venema, and Mohlendorph creeks in the mid-2000s after there were none for 50 years. The latter is named for the late Ted Mohlendorph, a biologist who spearheaded efforts to restore the watershed as salmon habitat. Though still plagued by problems endemic to urban streams, Piper's Creek today is a scintillating example of the possible. Though augmented by hatchery fish, anywhere from 200 to 600 chum salmon return each November, along with a few coho in the fall and fewer occasional winter steelhead. Inspirationally, several hundred small resident coastal cutthroat trout live in the watershed, believed to be native fish that survived decades of urban assault. An environmental learning center and programs are part of comprehensive restoration. More than four miles (6 km) of trail are maintained by neighborhood volunteers who put in 4,000 hours of work in 2003, for example. The creek waters are pretty in their impressively restored settings, but the watershed is the surrounding neighborhoods and streets, laced with petrochemicals, pesticides, fertilizers, wandering pets, and such. Along with steeply high volume during storm runoff and resulting turbidity, water quality is the remaining big issue in restoring salmon. The north fork of Pipers Creek is the site for the 110th Cascades, an S.E.A. (Street Edge Alternatives) street demonstration project (see above). The 110th Cascades are a creek-like cascade of stair-stepped natural, seasonal pools that intercept, infiltrate, slow and filter over 21 acres (85,000 m2) of stormwater draining through the project. The cascades are a part of an NDS (Natural Drainage Systems) project; together these united the community visually, environmentally, and socially, toward integrating the neighborhood as a community. Pipers Creek was renamed Piper's Creek by 19th century settlers A. W. Piper and his large family; the apostrophe is becoming less common today. Taylor Creek flows from Deadhorse Canyon (west of Rainier Avenue S at 68th Avenue S and northwest of Skyway Park), through Lakeridge Park to Lake Washington. With volunteer effort and some city matching grants, restoration has been underway since 1971. Volunteers have planted thousands of indigenous trees and plants, removed tons of garbage, removed invasive plants, and had city help removing fish-blocking culverts and improving trails. A deer has been spotted and sightings of raccoons, opossum and birds are common. By about 2050, the area will be looking like a young version of what it looked like before being disrupted. Taylor is one of the four largest streams in urban Seattle. Adjacent, formerly suburban city of Shoreline; southeastern neighborhoods. Fauntleroy Creek in the Fauntleroy neighborhood of West Seattle flows about a mile (1.6 km) from as far east as 38th Avenue SW in the modest 33 acre (130,000 m2) Fauntleroy Park at SW Barton Street, through a fish ladder at its outlet near the Fauntleroy ferry terminal (the creek drops a moderately steep 300 ft (91 m) in that one mile). Coho salmon and cutthroat trout returned as soon as barriers were removed, after concerted effort and pressure by citizen groups of activist neighbors (1989–1998). A further culvert blocks fish passage to Kilbourne Park and so on up to the headwaters in Fauntleroy Park. The 98 acre (400,000 m2) watershed is about two-thirds residential development, from 1900s summer colony to post-World War II urban, with the rest natural space, primarily Fauntleroy Park. Longfellow Creek is one of the four largest in urban Seattle. It flows north from Roxhill Park for several miles along the valley of the Delridge neighborhood of West Seattle, turning east to reach the Duwamish Waterway via a 3,300 ft (1000 m) pipe beneath the Bethlehem Steel plant (now Nucor). Salmon returned without intervention as soon as toxic input was ended and barriers were removed, after having been extinguished for 60 years. Construction of a fish ladder at the north end of the West Seattle Golf Course will allow spawning salmon up along the fairways. Farther upstream the city has been enlarging and building more storm-detention ponds, recreation areas, and an outdoor-education center at Camp Long. An area of 3 acres (12,000 m2) of open upland, wetland and wooded space just east of Chief Sealth High School in Westwood is the first daylight of Longfellow Creek. It has been the location of some plant and tree restoration since 1997. After more than a decade of preparation by hundreds of neighborhood volunteers, a restoration and 4.2 mile (6.7 km) legacy trail was completed in 2004. Further improvement by removal of invasive vegetation is ongoing as native species retake hold. Blue heron and coyote can be seen. The creek first emerges at the 10,000-year-old Roxhill Bog, south of the Westwood Village shopping center. Citizens of neighborhoods initiated a daylighting project in 2001, encompassing from above 38th Avenue into Lake Washington. Daylighting will return the creek to a new bed and replace the sloping lawn between Lake Washington Boulevard and Lake Washington with native plantings, and with the mouth of the creek at a restored 48,000 sq ft (4,500 m2) wetland cove on the lake. New culverts under 38th, the boulevard, and under a permeable pedestrian path will allow fish passage. Native plantings will restore about 1.5 acres (6,100 m2), with plantings three to four feet in height at three key view corridors. Planning continued through 2004, followed by design (2205) and construction (2006). The completion celebration is scheduled for spring, 2007. The $450,000 cost is funded by community-initiated grants and private donations. Citizen stewards of the creek and woods are represented by the Friends of Madrona Woods (1996). The urban forest encompasses about 9 acres (36,000 m2), largely in a couple ravines. The park area was built 1891-1893, officially no longer maintained since the 1930s with the demise of streetcars and pedestrian lifestyles. Persistent efforts began (1995) with informal removal of ivy smothering trees, then invasive species like holly, laurel and blackberries, and realization that effective restoration would require comprehensive stewardship. Friends of Madrona Woods earned a much larger Department of Neighborhoods matching grant in 2000, funding the creation of a Master Action Plan, and major trail restoration work. The community match for the grant was nearly 2500 hours of volunteer labor by community members and school children from St. Therese and Epiphany schools. After many decades of urban use without formal maintenance, substantial trail engineering was required. EarthCorps was contracted to do the actual construction, which included 86 steps, two landings and a bridge. EarthCorps is a local program to foster environmental responsibility and global cooperation among young people around the world. Two thirds the Corps members come from King County and the U.S., one third are recruited from partner organizations around the world. They combine the best elements of the 1930s Civilian Conservation Corps with those of the Peace Corps. Participants learn resource management skills by completing restoration projects throughout King County. This work has included restoring stream banks and salmon habitat, reclaiming logging roads, and building trails. They completed 30,000 hours of work in 1999 alone. In the process of clearing, volunteers found substantial erosion in the wetland hillside, leading to a grant from a Parks Department fund to stabilize it with a water cascade of natural materials. Neighbors did a little trail-building of their own with Volunteers for Outdoor Washington and an all-day trail building workshop (February 2000). Local school children learn about restoration by working with Madrona Woods volunteers throughout the year. Work parties continue monthly through much of the year. Mapes Creek, accessible at Kubota Garden, flows from a ridge to Lake Washington. Puget Creek flows into the Duwamish River from Puget Park on SW Dawson Street near 19th Avenue SW, near the Delridge neighborhood of West Seattle. The remaining watershed includes Roosevelt and parts of the University District. The creek flows past the Union Bay Natural Area into Lake Washington. Schmitz Creek in the Alki neighborhood of West Seattle flows to the sound from Schmitz Park, SW 55th Avenue at SW Admiral Way. Apart from the paved entrance and a parking lot at the northwest corner, the park has remained essentially unchanged since its 53 acres (210,000 m2) were protected 1908-1912 from complete logging. Fragmentary old growth forest remains. Daylighting and drainage rebuilding to handle seasonal and storm flow was done 2001-2003. Alki Friends of Schmittz Park are neighborhood citizen stewards of the park (and creek). The Porter Brook flows from the west of Sheffield on the edge of the Peak District and flows into the River Sheaf at Sheaf Street near Sheffield Railway Station. The Porter Brook is one of Sheffield's five well known rivers, along with the Don, Sheaf, Loxley and Rivelin. The Porter has been deculverted at Matilda Street near the BBC Radio Sheffield studios. A feasibility study for the scheme was undertaken for South Yorkshire Forest Partnership by Sheffield City Council in 2013  with funding from the Environment Agency and the EU via the Interreg North Sea Region Programme. The project was completed by Sheffield City Council with funding from the Environment Agency in 2016. Before and after pictures, taken from 2011 through to 2016, at www.deculverting.com show the scheme at the same location prior to commencement, during construction and completion. The site has been maintained since 2016 with the help of the Wild Trout Trust. The Porter Brook daylighting scheme featured in a 2016 BBC Radio 4 documentary entitled A River of Steel, produced by sound recordist Chris Watson, ex-member of Caberet Voltaire. . It was also discussed in an article in The Guardian in 2017 . In the United Kingdom, the River Roch that runs through the town of Rochdale has recently been uncovered, revealing the medieval bridge in place. It was covered in 1904 to accommodate a tram network that has since closed. In Seoul, which buried the Cheonggyecheon creek during the city's 1960s boom, an artificial waterway and adjoining parks have been built atop it. Mayor Lee Myung Bak, formerly a construction magnate with the Hyundai chaebol that helped bury the river, ran for office promising to daylight it, and achieved in 2005 a 5.8 kilometres (3.6 mi) greenspace in a city without very many parks or playgrounds. The new park is hugely popular, alleviating fears that opening the river would cause nearby businesses to lose customers. ^ Wild, Thomas C. (2011). "Deculverting: reviewing the evidence on the 'daylighting' and restoration of culverted rivers". Water and Environment Journal. 25 (3): 412–421. doi:10.1111/j.1747-6593.2010.00236.x. ^ a b (1) "Natural Drainage Systems Overview". About SPU > Drainage & Sewer System > Natural Drainage Systems. Seattle Public Utilities. 2003-12-03. Archived from the original on September 29, 2007. Retrieved 2006-06-06. (2) "Street Edge Alternatives (SEA Streets) Project Index". About SPU > Drainage & Sewer System > Natural Drainage Systems. Seattle Public Utilities. n.d. Archived from the original on 2006-05-12. Retrieved 2006-06-06. ^ Jone, Scott (2017-01-10). "Streams in the Urban Landscape". Retrieved 10 January 2017. ^ "Lost Streams of Vancouver". Retrieved 3 April 2014. ^ a b Jone, Scott. "Planning for Wildlife: Evaluating Creek Daylighting as a means of Urban Conservation" (PDF). Retrieved 10 February 2014. ^ "Hastings Park PNE Master Plan". Retrieved 2 April 2014. ^ "parking lot transformed into lush new urban park and restored creek". 2013-09-27. ^ "Transforming Hastings Park and the PNE". 2015-07-23. ^ "open house board on pne june 16" (PDF). ^ "Spanish Banks Creek in Vancouver, British Columbia (B.C.)". ^ "The stream that spawned a comeback". ^ "St. George Rainway Street". Archived from the original on 2014-04-13. ^ "East Side group aims to recreate lost stream with rainwater runoff". ^ a b c "City of Vancouver Park Board Report" (PDF). ^ Jencks, Rosey and Leonardson, Rebecca (2004). "Daylighting Islais Creek: A Feasibility Study," Water Resources Collections and Archives (University of California). Online version retrieved May 23, 2007. ^ Jason Dearen (24 April 2010). "Plans percolate to revive some SF native creeks". Associated Press. Retrieved 19 March 2019. ^ "Urban Design design group downtown development". The Baltimore Sun. 10 September 1990. ^ "Elevated expressway: Jones Falls expressway east side". The Baltimore Sun. 17 May 2009. ^ "Daylighting Rivers in Search of Hidden Treasure". 2013-11-13. ^ "Pipers Creek". About SPU > Drainage & Sewer System. Seattle Public Utilities. 2003-12-03. Archived from the original on 2006-06-14. Retrieved 2006-06-06. ^ (1) "Natural Drainage Systems Overview". About SPU > Drainage & Sewer System > Natural Drainage Systems. Seattle Public Utilities. 2003-12-03. Archived from the original on September 29, 2007. Retrieved 2006-06-06. (2) "110th Cascade". About SPU > Drainage & Sewer System > Natural Drainage Systems. Seattle Public Utilities. 2003-12-03. Archived from the original on September 29, 2007. Retrieved 2006-06-06. ^ "fauntleroy creek facts". Fauntleroy Watershed Council, Fauntleroy Community Association. Archived from the original on 2006-05-22. Retrieved 2006-06-06. ^ (1) "Fauntleroy Watershed". Fauntleroy Watershed Council, Fauntleroy Community Association. Archived from the original on 2006-06-17. Retrieved 2006-06-06. (2) "History, Fauntleroy Park". Seattle Department of Parks and Recreation. Retrieved 2006-06-06. ^ "Native Plant Stewardship Program". 2000 and 2001 Native Plant Steward Projects, P-Z. Washington Native Plant Society. 2004-10-12. Archived from the original on 2005-11-08. Retrieved 2006-04-21. ^ True, Kathryn (2005-08-18). "The poetry of Longfellow Creek". TRAVEL / OUTDOORS. The Seattle Times. Archived from the original on 2006-05-12. Retrieved 2006-04-21. ^ "Madrona Park Creek Daylighting and Restoration". 2006-01-11. Retrieved 2006-06-06. ^ The park area was built having a streetcar from Seattle, 1891, park 1891-1893, hotel 1892, part of the Olmsted Brothers grand plan for boulevards and parks, 1903, "Mosquito Fleet" steamboat, 1909, 15 minutes to the Alaska-Yukon-Pacific Exposition (1909) on the University of Washington campus. Seattle street car lines were torn up later 1930s-1941 in parallel with Los Angeles a few years later, and other cities in the U.S. "History". Friends of Madrona Woods. 2005. Archived from the original on 2007-09-28. Retrieved 2006-06-06. The Don Sherwood Files, Seattle Parks Department. (2) "About EarthCorps". Retrieved 2006-06-06. ^ Dolan & True, p. 223. ^ "Schmitz Preserve Park Improvements". Pro Parks Project Information. Seattle Parks and Recreation. 2003-06-13. Retrieved 2006-06-06. ^ "About Us". Friends of Schmittz Park. 2002. Retrieved 2006-06-06. ^ "Deculverting Sheffield's Porter Brook – City Centre (Article)". 2016-04-29. ^ "A River of Steel (Radio Programme)". ^ Cox, David (2017-08-29). "A river runs through it (Article)". The Guardian. ^ "Hidden medieval bridge reopens". BBC News. 2016-06-14. Retrieved 2017-11-09. "110th Cascade". About SPU > Drainage & Sewer System > Natural Drainage Systems. Seattle Public Utilities. 2003-12-03. Archived from the original on September 29, 2007. Retrieved 2006-06-06. "About Us". Friends of Schmittz Park. 2002. Retrieved 2006-06-06. "Carkeek Park Improvements". Pro Parks Project Information. Seattle Parks and Recreation. 2005-07-20. Retrieved 2006-04-21. "Creek initiative's sponsor asks court to dismiss lawsuit". Seattle Post-Intelligencer. 2003-06-25. Retrieved 2006-04-21. Kirk, Donald (2005-10-13). "Seoul peels back concrete to let a river run freely once again". World>Asia Pacific. The Christian Science Monitor. Retrieved 2006-08-21. File: Jae-Won, Lee. "A CITY RUNS THROUGH IT: Residents waded into the newly restored Chonggyechon River earlier this month in downtown Seoul, South Korea." Dietrich, William (2000-04-16). "Stream Salvation". "Living: Our Northwest", Pacific Northwest magazine. The Seattle Times. Retrieved 2006-04-21. Dolan, Maria; True, Kathryn (2003). Nature in the city: Seattle. Seattle: Mountaineers Books. ISBN 978-0-89886-879-1. "with additions by Sunny Walter and local Audubon chapters." See "Northeast Seattle" section, bullet points "Meadowbrook", "Paramount Park Open Space", "North Seattle Community College Wetlands", and "Sunny Walter -- Twin Ponds". "fauntleroy creek facts". Fauntleroy Watershed Council, Fauntleroy Community Association. Archived from the original on 2006-05-22. Retrieved 2006-06-06. "Fauntleroy Watershed". Fauntleroy Watershed Council, Fauntleroy Community Association. Archived from the original on 2006-06-17. Retrieved 2006-06-06. [No author, title], Seattle Post-Intelligencer, August 19, 1953. George, Kathy (2003-11-27). "Creek initiative sponsors allege bad faith". Seattle Post-Intelligencer. Retrieved 2006-04-21. "History". Friends of Madrona Woods. 2005. Archived from the original on 2007-09-28. Retrieved 2006-06-06. "History [Carkeek Park]". Seattle Parks and Recreation. 2004-09-10. Retrieved 2006-06-06.
from the files of Don Sherwood, 1916–1981, Park Historian, Don Sherwood History Files). "History, Fauntleroy Park". Seattle Department of Parks and Recreation. Retrieved 2006-04-21. Hodson, Jeff (2000-02-16). "Restoration urged for Thornton Creek : Local News". The Seattle Times. Retrieved 2006-04-21. "INITIATIVE 80 -- SAVE SEATTLE CREEKS". Office of the Seattle City Clerk. 2003. Archived from the original on 2006-02-05. Retrieved 2006-04-21. Jencks, Rosey; Leonardson, Rebecca (2004-11-29). "paper jencks". Daylighting Islais Creek : A Feasibility Study. Retrieved 2006-04-21. Overview and links to full document in PDF. Lehner, Peter; Aponte Clark, George P.; Cameron, Diane M.; Frank, Andrew G. (May 1999). "Strategies in the Pacific Northwest". Stormwater Strategies. Natural Resources Defense Council. Retrieved 2006-06-06. Date per "Stormwater Strategies Community Responses to Runoff Pollution ", additional chapter 12, October 2001. "Madrona Park Creek Daylighting and Restoration: Project Information". Seattle Parks and Recreation. Retrieved 2006-04-21. Mulady, Kathy (2003-07-31). "Restoration issue struck from ballot". Seattle Post-Intelligencer. Retrieved 2006-04-21. Mulady, Kathy (2003-03-18). "Critics rip Northgate plan". Seattle Post-Intelligencer. Retrieved 2006-04-21. Mulady, Kathy; McClure, Robert (2003-06-20). "Creek initiative finds foes in developers, Realtors, city". Seattle Post-Intelligencer. Retrieved 2006-04-21. "Native Plant Stewardship Program". 2000 and 2001 Native Plant Steward Projects, P-Z. Washington Native Plant Society. 2004-10-12. Archived from the original on 2005-11-08. Retrieved 2006-04-21. "Natural Drainage Systems Overview". About SPU > Drainage & Sewer System > Natural Drainage Systems. Seattle Public Utilities. 2003-12-03. Archived from the original on September 29, 2007. Retrieved 2006-06-06. Phelps, Myra L. (1978). Public works in Seattle. Seattle: Seattle Engineering Department. ISBN 978-0-9601928-1-6. "Pipers Creek". About SPU > Drainage & Sewer System. Seattle Public Utilities. 2003-12-03. Archived from the original on 2006-06-14. Retrieved 2006-06-06. Good list of news articles; also newsletters and official correspondence. Scott, Joan (2005). "Restoration History". Friends of Madrona Woods. Archived from the original on 2006-07-13. Retrieved 2006-06-06. "Save Seattle Creeks measure goes on ballot". Seattle Post-Intelligencer. 2003-02-25. Retrieved 2006-04-21. "Schmitz Preserve Park Improvements". Pro Parks Project Information. Seattle Parks and Recreation. 2003-06-13. Retrieved 2006-04-21. True, Kathryn (2005-08-18). "The poetry of Longfellow Creek". TRAVEL / OUTDOORS. The Seattle Times. Archived from the original on 2006-05-12. Retrieved 2006-04-21. Walter, Sunny; local Audubon chapters (2006-02-10). "Sunny Walter's Washington Nature Weekends: Wildlife Viewing Locations - Greater Seattle Area". Archived from the original on 2005-03-22. Retrieved 2006-04-21. Viewing locations only; the book has walks, hikes, wildlife, and natural wonders. Dolan, Maria; True, Kathryn (2003). Nature in the city: Seattle. Seattle: Mountaineers Books. ISBN 0-89886-879-3. Young, Bob (2003-06-20). "City files lawsuit to remove creeks issue from ballot". The Seattle Times. Retrieved 2006-04-21. Young, Bob (2003-07-31). "Initiative up a creek after ruling by judge". The Seattle Times. Retrieved 2006-04-21. Includes summary title of Initiative 80. Map of the landscape carved by the Vashon Glacier some 14,000 years ago. This page was last edited on 19 March 2019, at 21:33 (UTC).